How do I start a blog website? I am going to start blogging because I’ve heard that it is a fun, creative and productive way to do business online or a way to express how I feel or a way to promote my business. I’ve also heard that with a blog I can build a community and share my knowledge and expertise with other online. Blog software is easy to use and by writing down my ideas and comments, I can publish my own blog. It is important to note that blogging is inexpensive. Blogging is also a great way to communicate with others and is an effective way to get my message out to others on the Internet. With a blog I can write articles about certain subjects, sell a product or interact with others on a variety of topics. Blogging is also a very effective way to share my expertise on certain topics such as selling, creating and promoting a product, giving my analysis of a book or offering advice on current world topics. To conclude, like many others, I don’t feel that I have to be an expert writer in order to create a blog. All I need is a desire to write and a desire to share with others. Nothing is going to stop me from doing something I know I will enjoy. 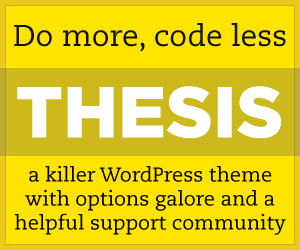 In my next blog I’m going to discuss how the following tools can help —Hostgator, WordPress and Thesis. I will also discuss in my next blog about the simple steps involved in creating a blog or website.